Batman: The Animated Series! Fans of Batman: The Animated Series and The New Batman Adventures rejoice! 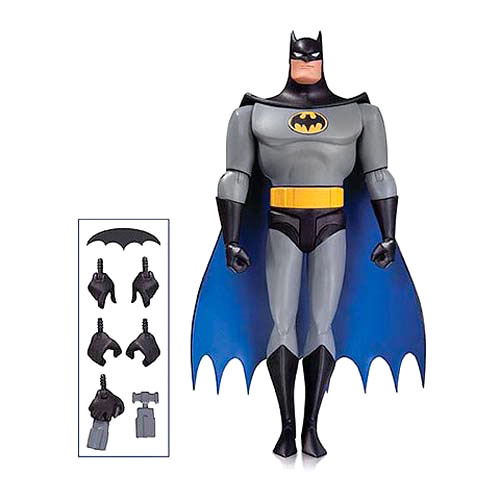 Based on the designs of Bruce Timm, comes this Batman: The Animated Series Batman Action Figure as he stands 6 1/2-inches tall. Bruce Wayne is decked out in his gray and black outfit, yellow utility belt, black and yellow Batman symbol, and comes with a ton of accessories, including a batarang, a grapple gun, and a character specific stand. The Batman action figure features multiple points of articulation and comes in blister card packaging. Ages 14 and up.